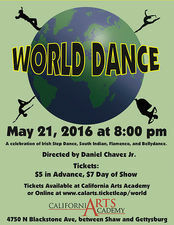 World Dance is one of CalArt's unique dance concerts. Every semester, California Arts Academy does a Variety Show which gives the majority of their classes the chance to perform and show off their newly developed skills and techniques in the form of dance. However, not every class fits into this concert category with ease. So, in order to make sure every class receives a performance opportunity, the World Dance concert was created! It's the opportunity for every genre of dance class to show the community the hard work they've put into their dance and routines, as well as put on an exciting performance. This concert's focus is specifically for the foreign dance classes. It is composed of their in-house Belly Dance, Flamenco, and Irish Step Dance classes, plus fantastic performances from community dancers such as Lesandre Avery's South Indian Tribal Dance group. Choreography for the Belly Dance portions comes from Sylvana Klein, CalArt's resident Belly Dance teacher. 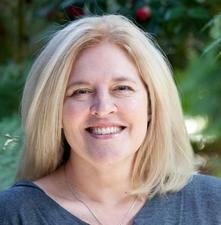 Irish Step Dance is choreographed by Hannah Anderson. Flamenco is lead by CalArt's new Flamenco instructor, Ricardo Ramirez-Ghimenti. It is a one-performance-only production, performing in their Blackstone Theatre (at the California Arts Academy) on May 21 at 8:00pm. 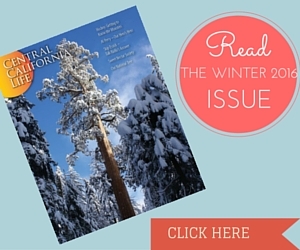 For more information about California Arts Academy and their programs, visit their website.